Maleimide Linker Oligo modification is a post synthesis conjugation to a primary amino group thus an additional modification with an amino group is required. A C6 or C12 amino group can be placed at the 5' or for the 3' end a C3 or C7 amino and for internal positions an amino modified base is used, e.g Amino dT C6. Direct coupling of maleimide for oligo synthesis is available only for the 5� end and requires a tedious activation step by the user. 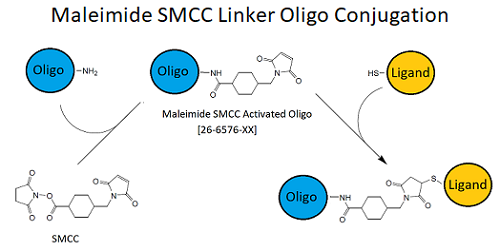 An alternate offered by Gene Link is a post synthesis introduction of maleimide at any position of an oligo by conjugation with a primary amino group using SMCC crosslinker (Succinimidyl-4-[N-maleimidomethyl]cyclohexane-1-carboxylate). 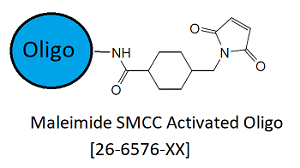 SMCC is a heterobifunctional crosslinker with an NHS and maleimide; the oligo post synthesis SMCC conjugation is performed first to the primary amine group(s) of the oligo to the reactive NHS ester to form a stable amide bond yielding an activated maleimide. The cyclohexane ring in the 9-atom, non-cleavable spacer arm of SMCC decreases the rate of hydrolysis of the maleimide group. The oligo with maleimide activated intermediate is quite stable and provided lyophilized and ready to use for conjugation to thiol activated surfaces, ligand, proteins, haptens etc.